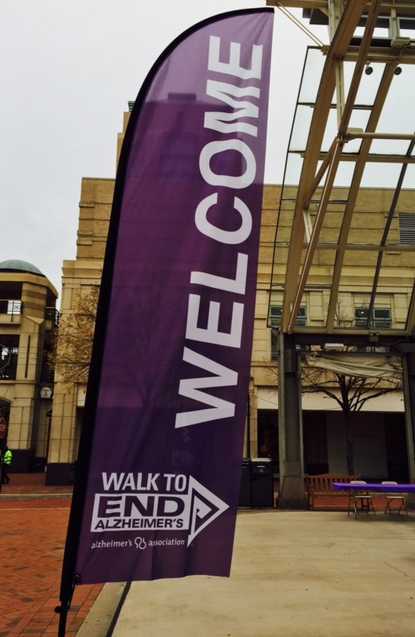 In our continued service of our community, the MiyeWire, LLC team leant a helping hand for this year’s Walk to End Alzheimer’s event in the Reston Town Center on Saturday, September 26, 2015. 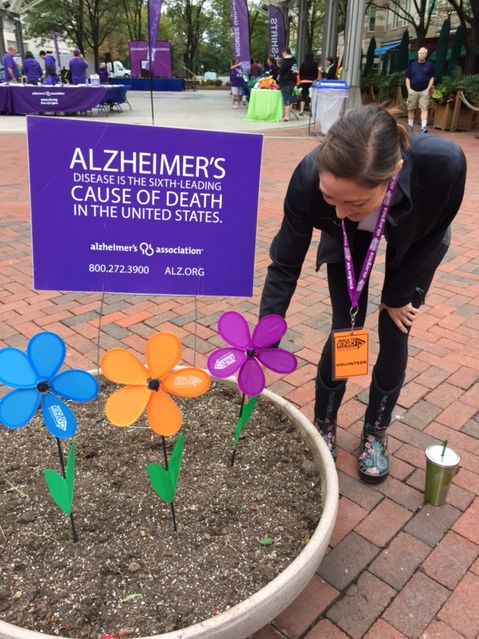 The Alzheimer's Association leads the way in Alzheimer's awareness, promoting public education about this devastating disease and organizing volunteer events to raise funds that support much-needed research for a cure. 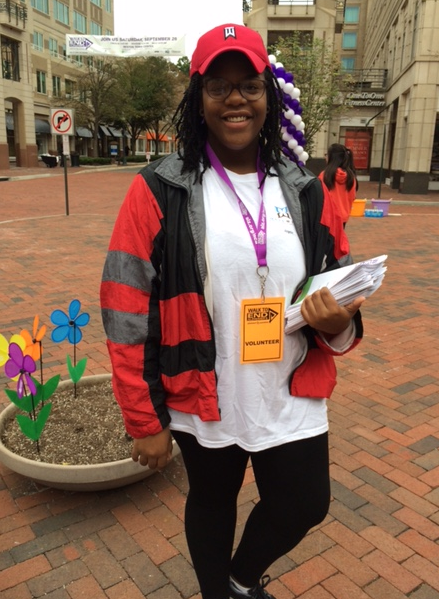 Miye helps decorate the registration entryway. Our Administrative Assistant, Angelie Benn, greets walkers with a warm and friendly smile. Miye, Angelie, and Maynur greeted walk participants and helped guide them to the registration area while Katelyn assisted with the event set-up. Walkers followed the 2-mile winding path through and around the Town Center. Afterwards, coffee and bagels were served. 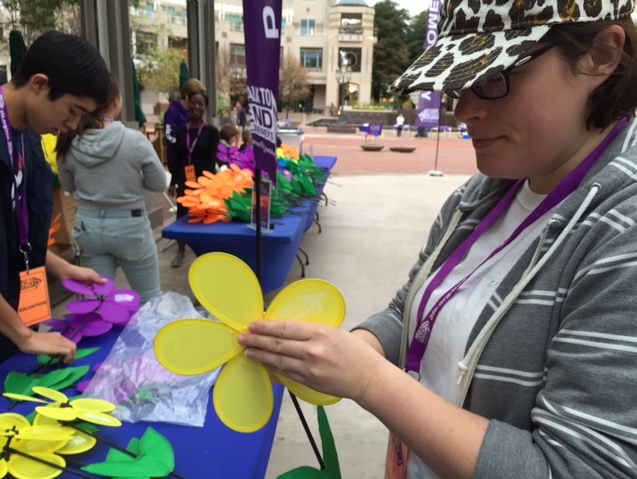 Here, Katelyn, our Client Services Director, helps assemble flowers for participants of the walk. Participants of the walk carried flowers with them. Each color symbolized the varied impacts that Alzheimer’s disease has had on their lives. A purple flower denoted someone who has lost a loved one to Alzheimer’s; a yellow flower represented someone who is currently caring for someone with the disease; a blue flower represented a walk participant personally battling Alzheimer’s or dementia themselves; and an orange flower denoted a walk participant who is simply championing for a cure. From left to right: Angelie, Katelyn, Miye, and Maynur post for a group picture. 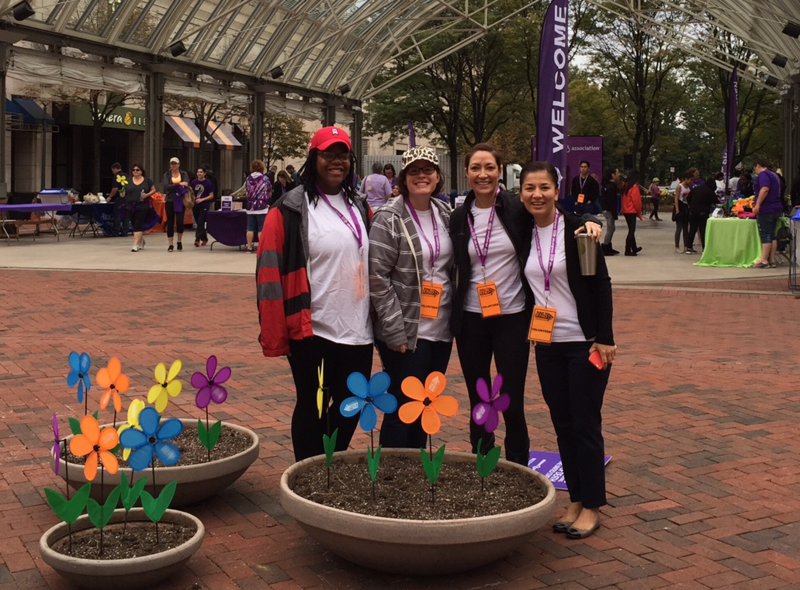 Our team thoroughly enjoyed helping out with the Walk to End Alzheimer’s. We had a great time meeting and talking with our friends and neighbors that participated in the walk, and we are glad to have the opportunity to assist with such an important community event!